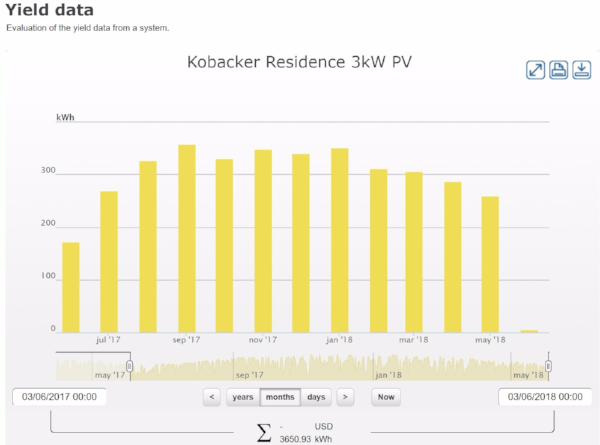 Here is a guest blog by Marlon Kobacker, a renewable energy expert and work colleague, about his solar system, what went wrong, how he used data to find out, and his solutions. Thanks, Marlon. "You shouldn't have to have a degree in Photovoltaic Engineering and be an active member of the Australian PV industry to make a 2.6kW system work." I sent Marlon an article by Nicole Hasham, Environment and Energy writer at the Sydney Morning Herald about how 1 in 5 Australian household solar systems are underperforming. Here is his reply. Thanks Michael. That article prompted me to interrogate my 2.6kW system data again. It would seem that it is performing beyond its expectations! Note: They entered "3kW" in the software - it's only a 2.6kW system. But I only know that because I interrogated the technical data sheets. I also note that when I was on the market for a PV system I had done system performance calculations and showed the sales guy - he wasn't able to carry the technical conversation about design and performance parameters, so I was probably a special case. - I asked for monitoring equipment and software, which took 9 months to get someone here to make work, and this showed me that the inverter was in fact down for 6 months, again wasting income. Apparently the mains had shut the system off from some kind of overload situation, and it never came back on. And I had no idea. You shouldn't have to have a degree in Photovoltaic Engineering and be an active member of the Australian PV industry to make a 2.6kW system work.